Plans usually start with an intensive one- to six-month schedule, tapering off as clients naturally take more personal control over their holistic health plan. Relapse Prevention Plan: Although most commonly associated with drug and alcohol abuse, relapse can include all types of behaviors. Faith-Centered Fitness helps people turn from destructive lifestyle patterns into new all-encompassing healthful lifestyles. Faith-Centered Wellness for Families: Includes a written health assessment for each member of the family. Personalized training and performance goals are established and documented for each member. 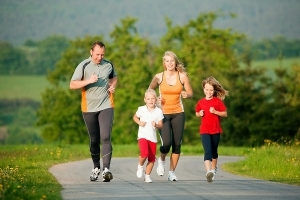 Whole-family goals are explored and created by the family unit; directions, ideas for implementation, and prioritization assistance from fitness coach. Nutrition Lesson Plans can also be customized for families. Small and Large Groups: Would your school, place of employment, or community organization benefit from a holistic wellness program? We also offer customized programs for small and large groups. Contact Kimberly for more information.